New book, 48 pages, NVG191. The Italian army, unlike those of the British and French, did not use tanks in combat during World War I and, by November 1918, only one training unit equipped with French Schneider and Renault tanks had been formed. 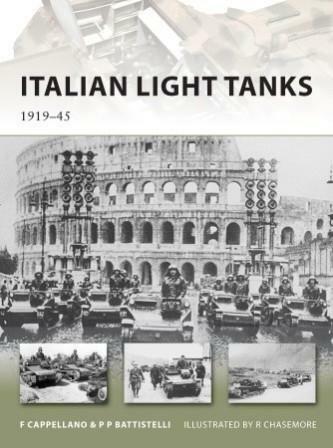 This would largely influence the development of Italian armour during the interwar period - having not had any chance to evaluate firsthand the use of armour on the battlefield, and given the overall strategic settings that saw Italy preparing for a possible war against either France or Yugoslavia (whose borders with Italy were set in mountainous terrain), the armoured and mechanized component of the Italian army was sidelined and considered of secondary importance. Consequently, during the 1920s the Italian army only had one single tank in its armoured inventory - the Fiat 3000. This was an improved Italian-built version of the French FT 17 light tank of which some 100 samples were built, but no experiments were carried out in the field of armour, with the exception of the development of wheeled AFVs for use in the African colonies. Only in 1927 was the first tank unit formed as a branch of the infantry (as with other specialist troops such as the Alpini or Bersaglieri) and not as an independent organization, while the cavalry rejected the idea of both tanks and armoured cars and decided to stand by the use of horses for its mounted units. Consequently, the Italians went into World War II without a tank capable of taking on medium tanks in the North African desert. In their 1st campaign against them, an army of 30,000 British troops destroyed an Italian army of over 250,000. This item was added to our catalog on Sunday 24 June, 2012.